Cut peel and white pith from oranges with a sharp small knife. Working over a sieve set over a bowl, cut orange sections free from membranes, letting sections drop into sieve. Cut goat cheese into fourths and pat each portion between your hands to form a disk. Pat pecans all over each disk to coat. Bake on a small baking sheet in middle of oven until heated through, about 5 minutes. Measure out 1 tablespoon orange juice from bowl and whisk together with mustard, vinegar, salt, and sugar in a large bowl. Add oil and whisk until blended. 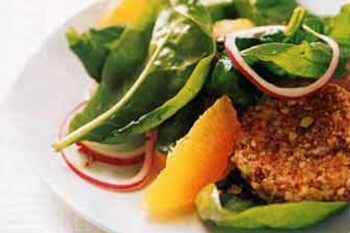 Add spinach, onion, and orange sections to dressing and toss well. Season with pepper. Divide among 4 salad plates and carefully transfer 1 goat-cheese disk to each salad.